Jay Leno, the iconic former Tonight Show TV host comedian, will emcee the first Genesis Prize award ceremony in Israel, a $1 million prize given to outstanding individuals who "embody the character of the Jewish people and values...and the State of Israel." The first recipient of the new prize will be former New York City mayor Michael Bloomberg, who will come to Israel to receive the award. Bloomberg has said he will donate the $1 million prize to a charitable cause. "Jay Leno is a comedic icon who has entertained millions of people around the world for over 20 years," remarked Stan Polovets, Chairman of the Board of the Genesis Prize Foundation. "What many don't know, however, is that he is also a great friend to Israel." Aside from hosting the Emmy winning Tonight Show, Leno has given numerous benefit performances and joined various philanthropic causes. 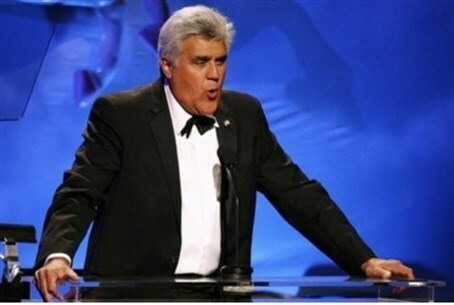 "It is a great honor to be invited to host this prestigious event," said Leno. " I am very excited, this will be my first visit to Israel and I can't wait to be a part of the Genesis Prize ceremony." The prize will be presented to Bloomberg by Prime Minister Binyamin Netanyahu. The monetary prize is to become an annual event, organized by the Genesis Philanthropy Group together with the Prime Minister's Office and the Jewish Agency for Israel. Natan Sharansky, Chairman of the Executive of the Jewish Agency for Israel, and Chairman of the Selection Committee of the Genesis Prize, added his appraisal of the new institution. "The development and strengthening of Jewish identity in Israel and the Diaspora contributes to the welfare of humanity across the world. Only by modern-day Jews' better understanding their Jewish values and heritage can we fully realize our potential to build on the achievements of the past," remarked Sharansky. Sharansky added "the Genesis Prize is an important milestone in the work of the Jewish Agency, the State of Israel and Jewish philanthropists towards the union and the strengthening of the Jewish people." According to the prize's website, its "winner will embody core Jewish values, such as a continuing commitment to social justice, philanthropy and intellectual achievement."